Is DC Comics Spearheading a New Age in Super Hero Comics? Since new Vice President Executive Editor Dan Didio joined DC Comics, plans were put in place with a select group of writers to reinvigorate DC’s super hero branch through a three-year plan. The emphasis has been on the monthly series they publish and the direct market where the company’s existing customer base already purchases comic books. DC Comics’ approach so far has been different to other publishers’ strategy. Will their plan work? DC’s renewal started last year with 2004's Identity Crisis written by Brad Meltzer and illustrated by Rags Morales, and Michael Bair. The format was highly unusual for a revival. It was a seven-issue mini-series with but a few crossovers in other titles. However, as older revivals and major comic book company, Identity Crisis was used as the launchpad of several new series, such as the new Firestorm and the Manhunter. Unlike other crossovers, several dangling plots were left unresolved at the end of the story and that’s where DC Comics’ revival started in early 2005. 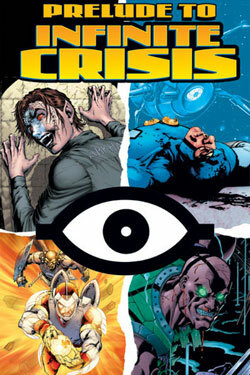 The publisher released several mini-series leading up to Infinity Crisis, another mini-series where other dangling plot threads from the previous series would be solved. Although there were five main series, Countdown to Infinite Crisis, Villains United, Day of Vengeance, The OMAC Project, and The Rann-Thanagar War, there are other series, tied to the current revival. Writer Grant Morrison has been working on a maxi-series with seven mini-series based on the Seven Soldiers of Victory. This series re-imagines the comic book genre by using established characters and new versions of older one. Whether or not these series are part of the new standard super hero universe from DC Comics is not an important matter. The sheer size of this series alone is more than a year’s worth of work released in a brief period. On another front, writer-artist Phil Jimenez is reintroducing Donna Troy to the DC Universe as the heroine that ties all of the current events within the new Infinity Crisis. 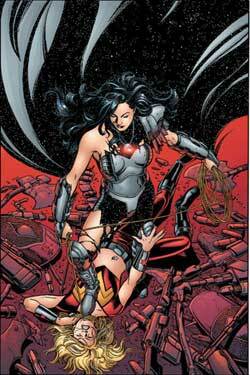 Unlike the other DC series that were truly born from dangling plot threads from Meltzer’s Identity Crisis, The Return of Donna Troy reuses the continuity from the classic Crisis on Infinite Earths, the original maxi-series that inspired Infinity Crisis. Infinity Crisis is really an attempt to recapture the energy and innovation that were produced in the Crisis on Infinite Earths series that span twelve issues in 1984-85. The effects of this series were a total creative reboot of the DC Universe with new talents joining, characters being reinvented and lots of experimentation. 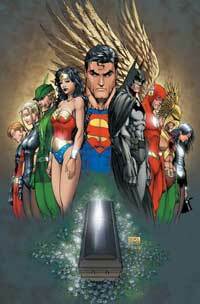 This aspect of the 2005-2006 Crisis event from DC Comics seems to be hinted desired by the publisher. Meanwhile in 1984, Marvel Comics, DC’s main American competitor, released the Secret War mini-series to match the latter’s offerings. 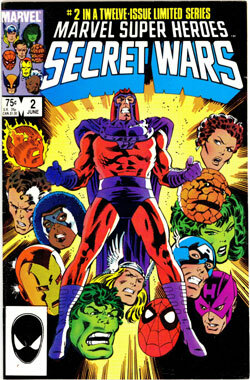 Secret Wars was much less planned and inspired than Crisis on Infinite Earths. In fact, only memorable for the changes that Jim Shooter, the Marvel Editor in Chief at the time, like the black Spider-man costume, are remembered. The actual story is a wasteland. Knowing that DC Comics was about to reboot its super hero comics, Marvel tried to match 2004's Identity Crisis with two series. First, there was Identity Disc, about villains trying to get a disk containing information on all Marvel super heroes. Then the Avenger’s Disbanded storyline replaced the Avengers with Marvel’s most popular characters. Although both of the major series introduced by DC Comics and Marvel Comics in 2004 had their ups and down, Identity Crisis was the better event and series in the super hero market of that year. DC Comics built its’ revival on the same event. Marvel tried too, with the 2005 House of M event, tied with the events of the Avengers Disbanded story. However, Marvel’s promotion is weaker and the story not as smooth as DC Comics’ Infinite Crisis. The problem lies in the fact that Marvel, unlike DC Comics, tried to spearhead a comic book event using old and tried techniques that have proven risky and are not popular anymore. To follow most of House of M, one must purchase several series along with a main one. DC Comics’ use of several self-contained mini-series is much more easy to follow by comic book fans. Although several other series such as DC Comics’s JLA series are required readings for Infinite Crisis, short and well-labelled series work better. In the past, the work on one publisher always propelled generational revivals in the American super hero market. For example, the early Silver Age, around 1955-1960, with the revival of the super hero genre was brought by DC Comics. However, Marvel Comics, generated the sophistication of storytelling and characterization occurring in the middle Silver Age. At the time, DC Comics’ revival effect had already worn off. 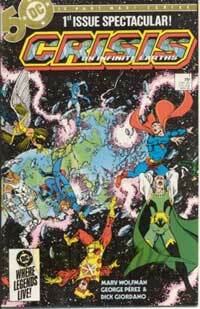 In 1984-85, Marvel was left in the wake of DC Comics’ Crisis on Infinite Earths. There are few differences between Marvel comics just before and just after 1984, unlike DC Comics. Yet, Marvel is responsible for the aesthetic revival and the slowed down storytelling and decompression of stories since the year 2000. In that period, thanks to new editor Joe Quesada, the production value of comic books and the aesthetic value of super hero comics reached the best of the super hero American comics. During that time, DC Comics followed Marvel Comics’s lead and improved its offering too, but without ever setting the agenda. Amazingly, just when Marvel’s aesthetic and storytelling revival calms down, DC Comics escaped from its competitor’s shadow. Although Marvel Comics looks like is losing the competition, if history repeats itself, it should lead the next revival in about five years. Yet will Marvel be patient enough to wait that long?